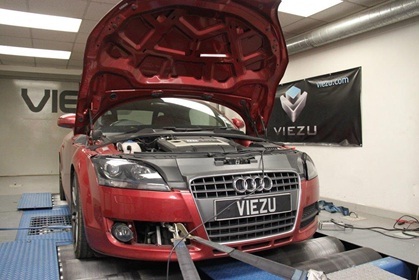 Here at Viezu we are always looking at enhancing our world famous 2.0 TFSI Viezu performance tune, DSG has given us the perfect opportunity to do just that. We decided that there would be no better way to do this than to run the vehicle on our state of the art Mustang MD500 AWD dyno, and show the effects of the calibration changes had to the power output and the gearbox shift speeds. Combining the industry standard power runs with our unique ability to run ¼ timing runs on the dyno. 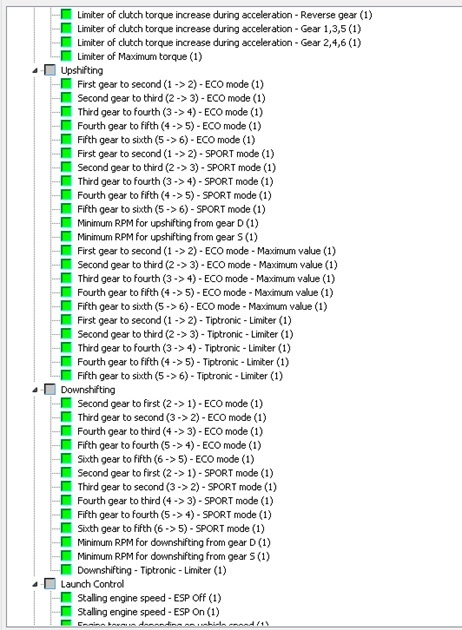 With a full drag tree setup and extremely precise timing system, we are able to accurately measure the real world improvements of our DSG and Engine remap. 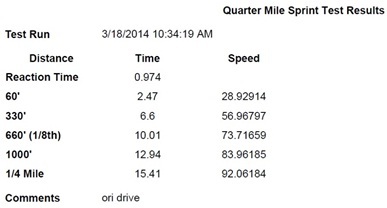 We start the development by getting a base line of the vehicles stock timings over the ¼ mile dyno run. This showed consistent readings with the drive gearbox setting being taken as the marker for the base and modified testing with the most consistent timings over the ¼ mile runs. 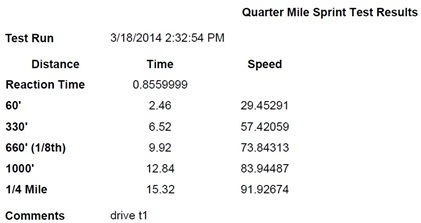 Below you can see the original timings for the DRIVE setting on the gearbox over the ¼ mile timed runs. The Kess V2 is then connected to the DSG communication port and the data was read from the gearbox control unit. 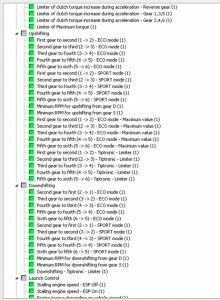 With this we were then able to make the necessary modifications to the software to optimise the shifting of the gearbox within the capabilities of the ECU and most importantly within the thresholds and capabilities of the gearbox itself. limits and of course? launch control! 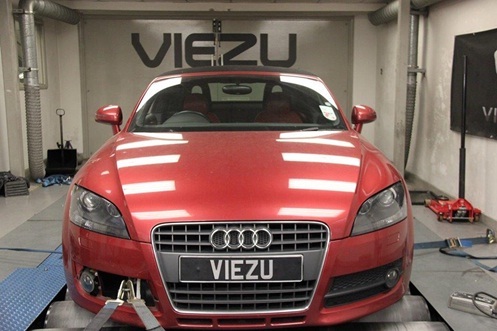 Following the modification of the DSG software with our bespoke Viezu remap, the car was rerun on the dyno through the ¼ mile simulation test program. The figures speak for themselves with an improvement from the DSG software recalibration alone, improving the cars ¼ mile times by over a tenth of a second. Running the car in normal DRIVE mode doesn?t truly show the fullest extent of the improvements that can be felt when running in tip tronic or SPORT mode, but due to tyre slip in the more aggressive sport and tip tronic settings we had to use DRIVE for consistency. 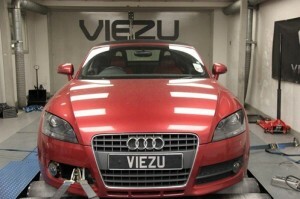 For the final test we uploaded our Vperf file on top of the DSG remap too truly see the improvements that we can offer, and proceeded to rerun the car. 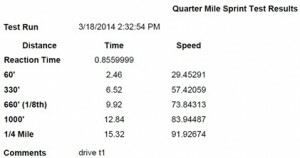 This time the car was over 6 tenths of a second quicker nearly over ¼ mile. The car would have run over 1.4 seconds faster if the additional power could have been put down on the rollers. Unfortunately the 50 hp increase to the engine over powered the tyres and equalled a lot of wheel spin. 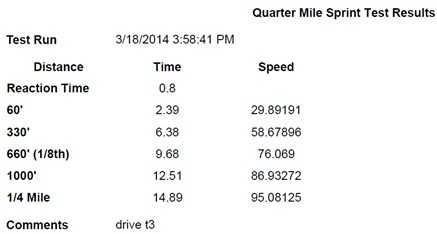 The figures are below show the final ¼ mile times with the remap and calibration on the DSG and engine control unit. The feedback from the owner from on the road testing really had to be heard to be believed. "Phenomenally quicker to shift!" "the launch control is sooo addictive!" "I can?t believe how much nicer to drive the car is!"